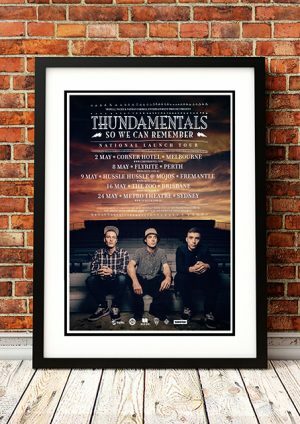 Classic Thundamentals Band Concert Posters and Memorabilia! Buy Online Now! Thundamentals are an Australian hip hop group originating from the Blue Mountains region bordering the metropolitan area of Sydney. The members are currently Tuka, Jeswon, and Morgs. They have released two EPs and four full-length albums, the first being their self-titled EP Thundamentals in 2009, followed by Sleeping on Your Style in 2010, Foreverlution in 2011, So We Can Remember in 2014, and Everyone We Know in 2017. Thundamentals toured extensively around Australia during this time, headlining their own tours and also with international and local acts such as A Tribe Called Quest, Big Boi (of Outkast), MF Doom, Bone Thugs-n-Harmony, Drapht, The Herd and many more. In the Triple J Hottest 100, 2012, Thundamentals’ Like a Version recording of fellow Australian Matt Corby’s “Brother” came in at number 49. The original “Brother” placed number 3 the previous year in Triple J Hottest 100, 2011. In the Triple J Hottest 100, 2014, three of their tracks were voted into the countdown: “Something I Said”, “Quit Your Job” and “Got Love”. In December 2016 the group announced their new record label, High Depth. They also announced that their fourth studio album, Everyone We Know, would be released in February 2017 as the first release on the label. Thundamentals’ track “Think About It” came in at number 82 on the Triple J Hottest 100, 2016. We stock some awesome Thundamentals Band Concert Posters.